The Mikki Easy Grooming Combi Brush Small is an ergonomically designed double sided brush with soft nylon bristles on one side and nickel steel ball pin bristles on the other. The steel ball pins are mounted on an air cushion to enhance your grooming action and reduce any excessive brushing force. The ball pins help to brush out and minor knots and tangles, while the soft nylon bristles remove loose hair and stimulate natural oils that promote a shiny & healthy coat. The soft grip handle shape gives comfort and control while grooming, helping both you and your pet enjoy the grooming session. Ideal for short and medium hair breeds. Use gentle stroking actions to allow the ball pins to ease through any knots and tangles; removing any dead hair from your pet's coat. 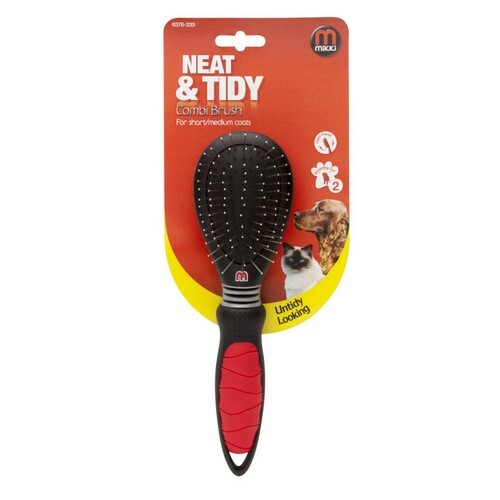 Then use the nylon bristles to help distribute your pet's natural oils through their coat, leaving the coat clean and healthy. Be gentle and careful at first until you are familiar with the action.